We received a review copy of Leatherface to help with creating our All the Meats Sliders. We’ve probably mentioned how much we love horror movies. At this point it really is no secret. One of our favorite series of horror films is The Texas Chainsaw Massacre. You probably remember our cocktail and snack pairing from a few Halloweens ago. For us, one of the most anticipated horror films this year is Leatherface. Our excitement only grew when we were given the opportunity to come up with a recipe for it. So today we’re thrilled to share our All the Meats Sliders! The idea for this recipe came from the Texas Chainsaw Massacre lore. The Sawyer family was always involved with the local slaughter house. They also have some cannibalistic tendencies. We thought it would be a little tongue in cheek (pun intended) to do a recipe with “all the meats”. Obviously, we left humans off the menu but the combo of hot links, brisket, and pulled pork does the trick. We topped the whole thing off with a bit of Texas style bbq sauce and viola! You have the perfect snack for your Leatherface viewing. 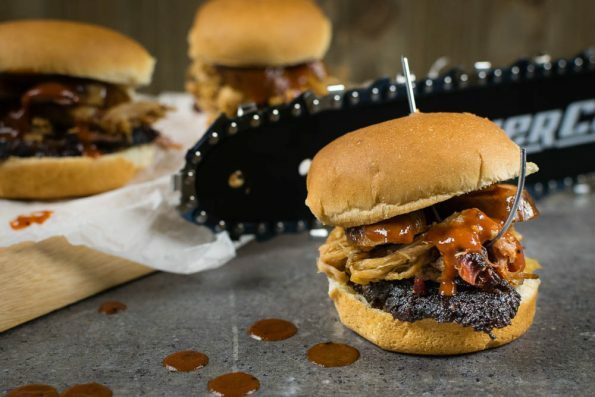 We hope you enjoy our All the Meats Sliders! What’s your favorite Texas Chainsaw Massacre film? Leave a comment below or tag us using the #GeekEats hashtag. 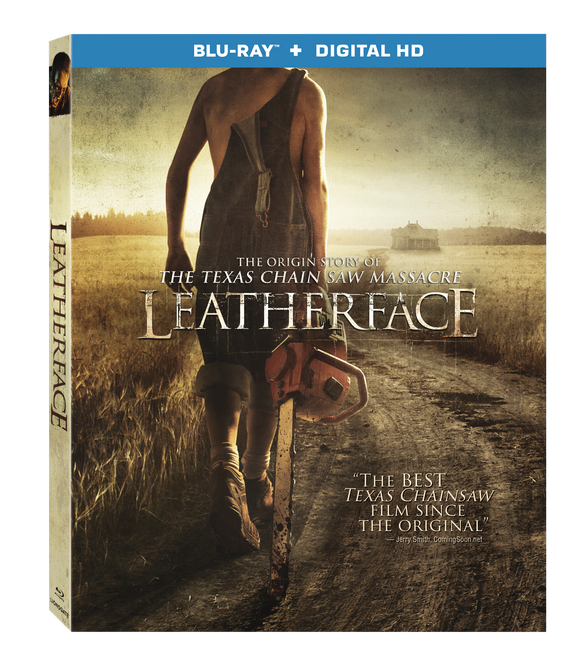 Don’t forget, you can pick up your copy of Leatherface which is available today on Blu-ray, DVD, and Digital! 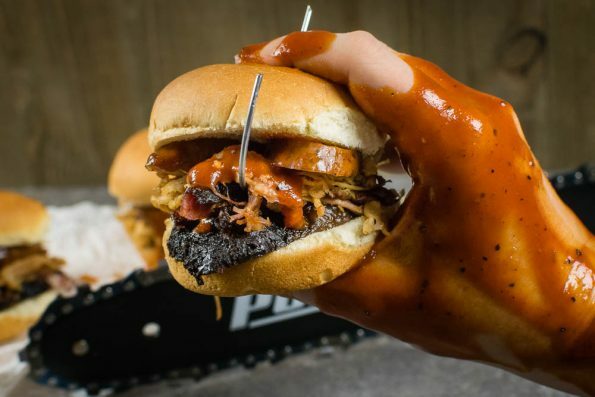 Each roll should be constructed by placing a slice or two (depending on the size of the piece) of brisket, some pulled pork, and 2 slices of hot link on the bottom slider bun. Top with bbq sauce and top bun. The Geeks were provided with a copy of Leatherface for research purposes. All opinions are wholly our own. View our Disclosure Policy for more info. Despite the fact that I’m not a fan of the mentioned movies (I love Japanese horrors, though) I like the recipe already cause I love the pulled pork! Well, yum! I am a meat eater and would devour these sliders. Love the gory story behind these and they actually look absolutely delicious too, double win! You had me at sliders! These look incredible. You got me with Texas barbecue sauce. Yes stub’s is my favorite one too. Love this all meat-sliders I will check into the DVD. These sliders look delicious! They will be perfect for game day! Agreed! They may be making an appearance at our Super Bowl party! These are so game day ready! And so simple, too, especially if you live near a good BBQ place!